Sri Venkateshwara Travels & Car Rentals, Recognized by Government of Karnataka, Department of Tourism, Established in the year 2000, since over 15 years serves travel needs 24/7 for 365 days, to Individuals, Groups, Companies and Corporate with a never ending smile. With a fleet of over 50 economy to hi-end cars, driven by experienced and disciplined chauffeurs are opted for rental service. We also cater to Bookings for Classic Hotels, Star Hotels and Air Ticketing for Domestic and International arena. 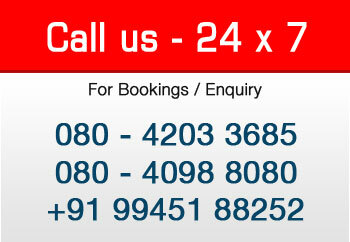 Train and Bus Bookings to various destinations are also undertaken. Being responsible for Punctuality, Safety and Surety , we are appreciated for our travel service, rendered to all our valued clients over the years, who have in turn, reciprocated with letters of appreciation to us. Holiday Packages and Honeymoon Packages are our specialities to its best for a lifelong memory. "Our motto is to serve each and every client who wishes to travel, be it a kilometre or thousand miles......with smiles." At Bangalore, we reach through a wide network covering Major Cities in India. Mumbai, Delhi, Hyderabad, Chennai, Pune, Kolkata, Coimbatore, Trivandrum, and Cochin, are a part of them. In pursuit of providing complete satisfaction to our valued clients, we always endeavour to arrange for best conditioned A/C or Non A/c Cars whichever preferred for smooth and a comfortable journey. Our company has a rich fleet of over 50 economy to hi-end cars of all models. You name it and we have it, at your door step whenever required. From anywhere to anywhere. are dressed in a neat white uniform. are appointed only with valid driving license with a badge to drive taxi. are verified with our special team of verification specialists to ensure safety. are paid as per Labour Act and given the facility of ESI and PF. are trained in regular intervals to maintain good behaviour and service. We are recognized by Department of Tourism, Govt. of Karnataka. We are Registration with Service Tax and possess valid PAN and TAN No’s. Income Tax is declared by our auditors well in time, every time. We are registered in the Labour dept, Shops and establishment Act. We are complied with PF and ESI for our staff and drivers. Our main strength is our staff who believe in team work and work with dedication. We have dedicated staff for each department. They are segregated for bookings and reservations / Enquiries / accounts / Billing / Fleet managers / vehicle maintenance / In plant supervisors / sales executives / Event executives and Customer care. All views and feedbacks from our valued customers are vital for us, It help us in catering to extensive requirements of customer from time to time and appreciate their support to us.